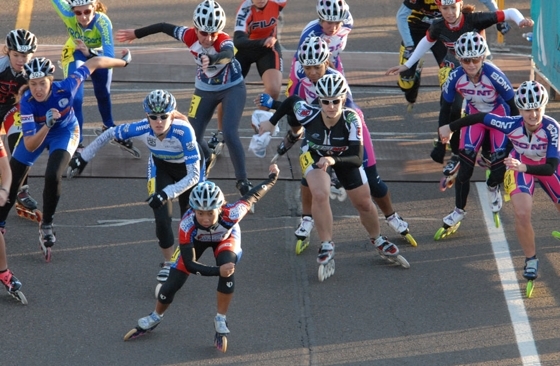 Into the Cold - The elite women skaters push off into the cold at the start of the Northshore Inline Marathon. Leading the way is Sara Sayasane of Milpitis, CA. Sayasane finished third in the pro elite division. Just behind her is Julie Glass (black skinsuit), a many-times world champion who returned to racing this year after giving birth to twins. On the far right is another former world champion, Cheryl Ezzell Kalmus. Sayasane finished third in the pro-elite division; Glass was fouth; Ezzell, fifth.